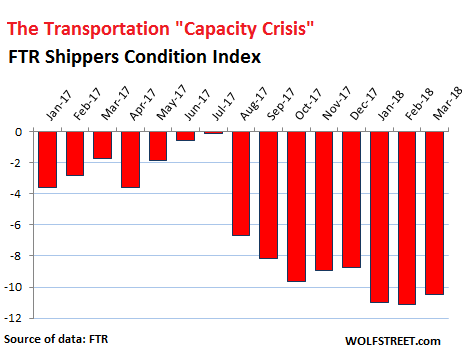 There are winners and losers in this transportation boom that has followed the “Transportation Recession” between March 2016 and April 2017, when shipment volumes by truck, rail, air, and barge had dropped to the lowest levels in years. During that time, trucking companies slashed orders for Class 8 trucks. Truck manufacturers – and the companies that supply them, such as engine makers – responded with layoffs. But this is history. 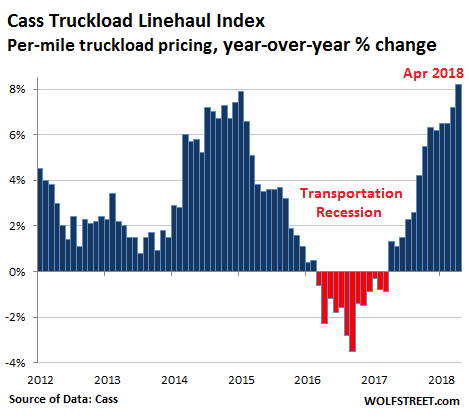 In April, freight volume by all modes of transportation surged 10% compared to a year earlier, according to the Cass Freight Index, which pushed the index to its highest level for any April since 2007. And among the winners are truck manufactures that are getting inundated with new orders. 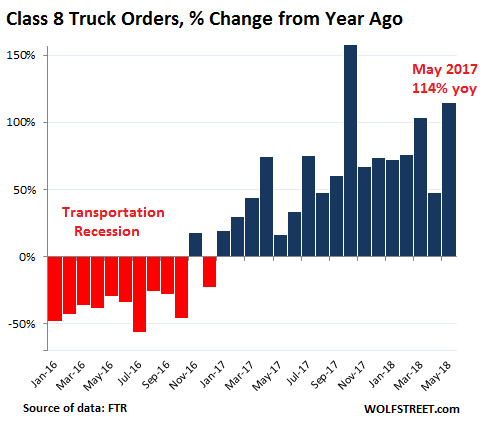 “Class 8 orders exceeded expectations again as fleets order in huge numbers attempting to keep up with burgeoning freight demand,” FTR explained. Manufacturers are now sitting on an order backlog of over 200,000 Class 8 trucks, or 8.4 months of production. Trucking companies have responded by adding capacity. The surge in capital spending may have also gotten a boost from the tax law changes that went into effect on January 1. Trucking companies, truck manufacturers, component makers, and so on – those are the winners from this boom. And here are the losers, namely the erstwhile winners in the Transportation Recession: shippers. During the Transportation Recession, they benefited from dropping freight rates and excess capacity. But now, any entity having to ship anything, or rely on it being shipped, or having to pay for shipping it, or waiting for it to be shipped — ranging from manufactures across the US economy to retailers and consumers — are having to deal with transportation constraints, delays, and rising transportation costs. Conditions remain highly unfavorable with tight capacity and rising rates in both truckload and intermodal sectors. Shippers may see some relief after the second quarter and conditions may improve further during Q4. One bright spot for shippers is that the hard enforcement of the ELD regulation [the Electronic Logging Device now required for trucks], based on spot-market data, does not appear to have had a major impact. Also read… Freight Costs, Volume, Demand All Surge across Trucking & Rail, Inflation Fears Heat Up. Velocity of money trickle-down begins, leading to the massiveFed- money-print hyperinflation we’ve all been expecting but not yet seeing. Truckers will be slapped with rising fuel prices. Our fleet was introduced to a new nanotechnology. My truck was among those that gained 0.75 MPG. We learned that one state’s DOT went fleet wide with it. Most of us are veterans and we used a non-profit fund-raiser to purchase it. The 12% fuel savings has made significant gain in our bottom line. With 18 years in the trucking “industry” as driver, owner operator and small fleet owner (with the marked deterioration of both physical and mental health to prove it) I might be considered a veteran. I can say that drivers participation financially in this boom is hardly noticeable. The mega fleets are still driving new drivers permanently out of the business within 6 months of entry via per mile pay starting as low as $.26 per mile and wages for experienced drivers trickling, begrudgingly, up to $.55 per mile. 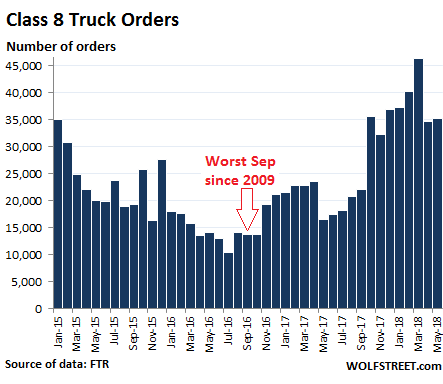 Factoring in the negative impact of the ELD requirement, estimated to be about a 20% drop in productivity, and the resultant lowering of pay to drivers thereby, it would appear that the surge in new Class 8 truck orders might be unjustifiably poor strategy in light of the fact that large proportions of mega and mid size fleets remain in the yards for lack of drivers. Wage suppression prevails. Tom, I sympathize with you. The heavy truck driver may be the most mis-characterized worker in America. Everything from contingency fee lawyers running TV ads promising big money to people injured specifically in an accident with a big truck to “Cowboys of the road” imagery in song and gossip. But one of you guys stopped to help my wife years ago, when her car overheated. He climbed down an embankment and got some water for her radiator from a stream. A different time, a different place, I came upon a woman on an isolated stretch of road here in WV. She was crying, standing beside her disabled car, holding a baby. She told me her husband was a trucker on the road and she had no way to reach him or the family friend who had recently fixed the car. I took her to a roadside phone booth and gave her the coins she needed to call somebody. Told her: ‘Nah! I’ve got five kids at home already – that’s enough”. What goes around comes around, and I hope more comes around for you, Tom. I think of them as the knights of the road. I was riding cross-country on a 250cc motorcycle, fleeing flyover country back to California and I swear those truckers were looking out for me. They all talk to each other on the CB, and they’d pass me courteously and professionally. I’m sure there are some bad eggs like in any profession, but as a group they are an example of the noble workingman (or woman). Truckers have always been very cordial in person to me and usually on the road, too. Yeah, there are a few bad apples, but as a group they are in fact the best drivers and have to deal with J6P and soccer moms flitting in and out of lanes on congested roads. I don’t know how these guys drive these rigs in heavy populated urban areas. I’ve also heard they now also have to fight off the very forward advances prostitutes (lizards?) in the trucking plazas. Tom, you and every other member of the 99% must play your designated role in working for peanuts so our oligarch overlords can extract the maximum wealth from the fruits of your labor. As a serf on the oligarchy’s incorporated neoliberal plantation, you have no intrinsic value as a human being. Rather, your worth is determined solely by the economic benefit you provide to a sociopathic, parasitic .1% who control our monetary and economic policies and have rigged the game against the increasingly pauperized middle and working classes. Have been working as an OO in tristate 25+ years ago this included delivering to Manhattan food stores on 18 wheel rigs, picking up in the sea port and on a separate gig driving the gas tanker in the same area. We were the bunch of cowboys cutting corners and regulations in order to make a buck. Thinking back I’m surprised that non got caught doing what was considered normal at the time. The work was hard but the reword was good. Guess the authorities were a lazy then, don’t know about now. You would think drivers would be somewhat protected because what they provide is a service that cannot be outsourced abroad. Perhaps the large corporations have taken over, putting all the profits in CEOs’ and shareholders’ pockets. Corporations don’t share productivity gains with workers any more, because they don’t care about tomorrow. Drivers wages are mainly constrained by two factors. First, the fact that any driver subject to federal hours of service regulations is exempt from the Fair Labor Standards Act and therefore not entitled to minimum wage or overtime. This is how the mega carriers can get by with such cheap per-mile pay. Second, the industry has come to be dominated by immigrants. A quick Google search says that roughly half the truck drivers in California are immigrants. I don’t care if they are legal or illegal, you cant　double the supply of a commodity or service without the price being reduced. Finally, I would add that quality drivers are in high demand and being well compensated. I parked my own truck last year in response to the coming eld law and took a California only job. In my little corner of the Emerald Triangle 75K a year is a good wage. I’m driving a chromed out 2017 Peterbilt flat top, home every weekend and a couple of nights during the week, have paid vacation and decent health insurance. I’m on paper logs and the people I work for treat me like gold. As I said repeatedly. Muppets have tons of money. Heck with the drop in deficit, etc, the Atlanta GDP Now statistics is showing a value of 4.5%. You can doom and gloom all you want, or complain against media whores, but the fact is America is great again. If you are not participating, then it’s your fault. Considering the real wages America is paying to it slowest paid and the conditions they re being made to work in the last thing America is is great at all. Those peopel cant participate, as their employers are not paying them enough to get off of food stamp subsidy’s. Forget the Atlanta GPD number. It’s too early in the data cycle of the second quarter (first estimate of Q2 GDP will be released on July 27). Q2 GDP growth is going to be fine, but I see no signs that it’s anywhere near 4.5%. Why would you refer to fellow citizens as muppets? 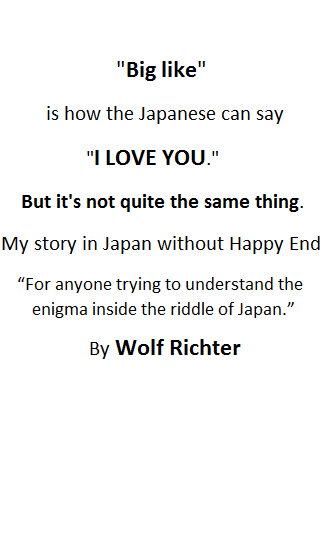 That, I don’t understand. I presume by that statement you are not one, yourself? Or, was this sarcasm? Greg Smith, a former Goldman Sachs employee who infamously quit Wall Street via a New York Times article, says the investment bank routinely took advantage of charities and pension funds in order to increase its profits. Traders referred to unsophisticated clients who foolishly trusted Goldman Sachs with their money as “muppets” who were ripe for the fleecing. Hence the origin of the term. That’s huge, going to see it was that big a jump in 2008. “Muppets” have money….and the refrigerator light stays on when the door is closed….but if this is American “greatness” revisited, we should definitely dissolve the Republic. America ceased to be a Republic in 1913, when we let a private banking cartel seize control of our money issuance. Thomas Jefferson’s warnings of what would come next have been remarkably prescient. Two things have to be kept in Focus when delivery times and order # of class 8 vehicles spike like this. In a boom bust industry cycle, which is what transport in America has become. By the time the order delayed new gear arrives, there is frequently no work for it. As to wages they need to go to on duty hours, as the most a driver can legally make on 26 cents is 16.50 Hr in the peak times. Which is not enough, to average to anything decent when you add in loading etc. Sounds like residential construction. Build times for house are taking longer and longer as builders claim they can’t find workers. But I’ve not heard much about raising pay to attract them. More importantly, these same complaining builders (Etc) all want to hire, experienced, qualified, Workers. Nobody (in any numbers ) is training, or willing to train, young peopel. Normally the ones who did not make college grade or go into the Armed Services. Which is an even larger fundamental industry problem. This seems to be endemic in our “market” economy. Shortage of workers is supposed to be a market signal that you need to raise wages in order to attract workers. But in dozens of cases I’ve seen this never happens. Firms will forego opportunities for growth so long as they don’t have to raise wages. We’ve seen this with nurses for decades–they’re always in short supply, but wages have crawled up since the 1970s. The answer has been to create inferior, less-skilled classes of nurses and hire them for crap wages. Same thing with the adjunct boom in academia. The number of courses taught by adjuncts in the nation’s universities is now approaching 50%. It’s either de-skill the job or create a pool of skilled people but redefine the job so that it no longer is full-time employment. I believe also that there are university lecturers in the UK who are only paid during term-time! All markets have their quirks, and human labor has a special quirk. Once the cost rises, it almost never goes back down. So it absolutely makes sense in the long-term to forego short term profits if it requires raising wages. Because you are killing your long-term profits. Which is why labor unions are so important. Labor unions only add to the hidden costs of employment. There are too many intermediaries in the employer-employee relationship. Get rid of FICA, FMLA, ERISA, EEOC (I’ve seen employees who were discriminated against for race and the only people paid were their attorneys) and employer-provided benefits etc. so that you basically don’t need a “Human Resources” department and you would greatly open up labor markets. Yes, I can hear the howls of laughter….I know that it won’t happen until the system completely breaks, but the answers are staring us in the face. But, no, every time socialism is exposed for the failure that it is, the cries for more socialism only become louder. Do high schoolers today even know what USSR stands for? As with any industry specific demand, capacity is cyclical. One can foresee a used transportation equipment overload, in the not too distant future. This portends a knock-on effect that will negatively effect the entire sector. All it takes is an economic downturn. In the mean time, the players are all madly dancing while the music continues. Until the tune ends. From what I’m reading truck drivers, nurses and construction laborers should be doing quite well but their wages are being suppressed because employers refuse to invest in their training. That is a major reason why our middle class has flat wages since the 1970’s and isn’t expanding as it used to. Businesses should realize that without an expanding middle class with rising wages they won’t have as many consumers of their products/services. I used to think that was a given, but I’m not sure any more. What do the people with money (say, top 5%) in the USA own/produce? Overwhelmingly its some form of government-sponsored monopoly (patent, copyright, license to practice medicine/law)), real estate, or money itself in various forms. The richest men in American are no longer Ford, Carnegie, Edison, Rockefeller, et al. Their wealth is no longer based on mass market material items, commodities purchased in the market place. They can build high-end condos for Chinese elites to park their ill-gotten gains (or, in the case of Trump Tower, Russian oligarchs and mobsters). They can lend their money anywhere on the planet. They can provide their services as corporate lawyers or concierge doctors to the Power Elite. Sure, there will be rich people servicing the niche American top 20% market, or abusing the bottom 80% via payday loans, Vegas casinos, car leases, and usurious credit card and college loan scams (or, more ominously, opioid prescriptions) but is anyone’s business model today dependent on a prosperous and expanding middle class? Organized labor (an other enterprises) historically had apprentice programs where both labor and management cooperated in the training of those apprentices. After the crushing of organized labor (some would impugn OL as being “socialist”; far from it. It is a capitalist advantage having those programs in competition) those programs have steadily deteriorated and we have what we have today: a shortage of trained personnel that had those programs, namely the construction industry and many others. Those with the capital just don’t want or choose to spend money productively except to line their own pockets. We get what we have expected, more greed, less training.